This example uses the Annotate facility to add labels to each area in a map of Belarus. The CHORO statement assigns the Annotate data set to the map. 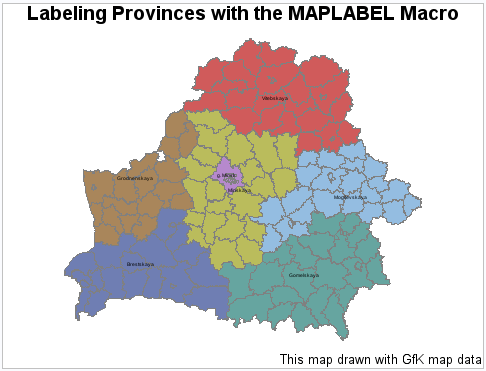 The %MAPLABEL annotate macro is used to create and position the map labels. For more information about this macro, see %MAPLABEL Macro. Define the title and the footnote for the map. Sort the GfK data by region and district variables. Use the GREMOVE procedure to remove the internal boundaries from the Belarus map.This prepares the data for the %MAPLABEL macro, which will determine the centroid of each province and then center each province label. Create the Annotate data set. The %ANNOMAC macro enables the annotate macros. The %MAPLABEL annotate macro creates the annotate data set. Produce the choropleth map.The NOLEGEND option suppresses the legend. The ANNOTATE= option specifies the data set to annotate the map. The COUTLINE= option outlines each province in gray. The STATISTIC= option specifies that the GMAP procedure will match the first observation from the BELARUS data set and output the response value from this observation only.